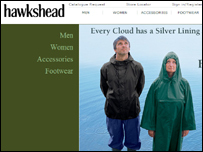 The operator of outdoor clothing company Hawkshead has gone into administration. Insufficient financing and "serious" problems with its mail order database were to blame, said Asher Miller of administrator David Rubin & Partners. Hawkshead, which has 20 stores and concessions and employs about 200 people, has continued to trade. Its owner, Branded Logos Ltd, has a warehouse in Workington and a call centre in Kendal, both in Cumbria. Delays to new stock orders compounded problems at the firm, Mr Miller said. The chain had "a loyal customer base and "enormous potential to operate successfully", he added. The administrator is now calling on potential investors to get in touch. It said that "significant investment" had been made into "the cleansing of the mail-order database" and that batches of "high-margin stock" were due in its stores in August. Mr Miller said that he felt an established retail operator would be able to restore Hawkshead to profitability.